MPanel FEA determines the fabric stresses, cable tensions, and corner reactions for a tensile structure under different loading conditions. This is a specialized problem, as the solution has to cope with orthotropic material properties, fabric wrinkling, slack fabric, slack cables, and large structure deformations. 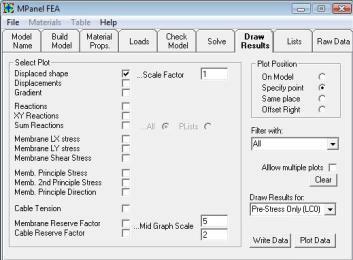 For tutorials on how to use MPanel FEA go here. 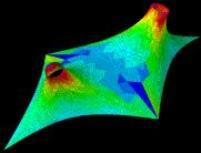 To request a demo of MPanel FEA please fill in our form here.